Thank you for all the lovely comments on my coat. It's been pretty cold in Belfast lately, and the coat is lovely and warm. So I think I will use the same fabric in black for another winter coat in the autumn. Anyway, onto this dress which was made before Christmas. By now you've probably spotted that my dress didn't turn out like this! I had planned to make a sleeveless, princess seam bodice with a half circle skirt. I didn't want the high-low hem because I'm not a big fan, and the underneath was going to be some fabric left over from this dress. Thankfully, I had the wit to lay the two fabrics out on the sewing room floor before taking the scissors to them. I approximated the shape of a half circle skirt in the tartan, then again with the black fabric over the top and the bottom edge folded up - but I wasn't feeling the love. Photos were taken on my phone, but I've deleted them, so you'll just have to take my word for it that it wasn't the vision that was in my head. So, a Plan B was required, and it was back to good old Pinterest! What did we do without it? 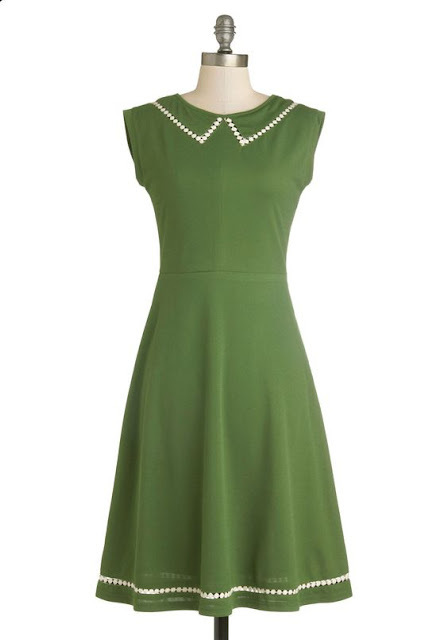 I found this Modcloth dress on my Sewing Inspiration board that previous me had the common sense to save. The thing that really grabbed me was the bodice and collar. The bodice reminded me of the By Hand London Anna dress, and I love a Peter Pan collar as much as the next person; the pointy edges and trim sold it. On closer inspection of this photo, it looks like a false collar, and the trim is sewn onto the dress bodice. Anyway, I loved it, so that's what I went with. I was going to make an Anna bodice with a more curved neckline and draft a Peter Pan collar (which is what I did), but then I spotted these capped sleeved in one of my pattern drafting books, so made them too. As mentioned, the collar is self drafted, and for reference is 1.5" deep. The flowery trim came from Sew N Sew in Belfast, and was £1 a metre. There was 2.5 metres left on the roll, so the lovely lady who owns the shop charged me £2 for the lot. It's only 50p saving, but that kind of customer service is why I love that shop. I sewed it on by hand, which was time-consuming, but I love how it looks. My original Anna bodice has been hacked to the nth degree, and this version is drafted from my block, so I was able to use my sleeve block to draft the sleeves. It's got me wondering if it would work with the original Anna bodice - my theory is that the bodice side seam and shoulder could be lined up with another BHL pattern with armholes, and then sleeves from another pattern could be added. I haven't tried it, and have just googled it with no good results, so maybe not. - Sorry about that random stream of consciousness!! Anyway, the fabric looks and feels like linen, so has a looser weave which made it a little opaque, so I underlined the bodice with some black cotton lawn. The skirt is underlined with black polycotton because black lawn is not cheap, and hard to come by! This lead to an interesting method of construction as I didn't want a facing due to bulkiness. sewed the darts and pleats. Hope that makes sense! I'm putting it here as a reminder to myself in case I want to make it again. I love this dress, and the underlining makes it nice and warm. so hopefully it will turn out like it looks in my head! Thank you! I fotgot to say that I ended up having to stitch the collar in place at the front and back corners, and also the shoulder seams. It wouldn't sit flat because it's only 1.5 inches deep. Another lovely dress Lynne! I particularly like the trim on the collar - subtle but very pretty! Thank you! It took ages to sew on by hand, but I think it was worth it! I love the trim on the collar, it's perfect! Thank you! I had an idea of what kind of trim I wanted, but couldn't find it on the interwebs. But there it was in my local shop! 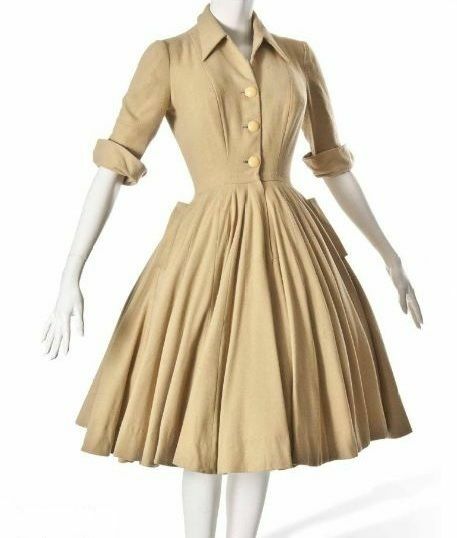 This is such a lovely dress - I really like the Anna pleats - the collar is a really pretty addition!